Our first home we bought was in Seattle. It was in a cute urban neighborhood and we were lucky enough to have a lot with a very private backyard. There were huge evergreen trees that made us forget that we lived on a very busy street. Of course, that also came with lots of shade. Shade can be very discouraging when you’re first developing an interest in gardening. I wanted to grow flowers and vegetables and didn’t have too many places in my yard to do it. 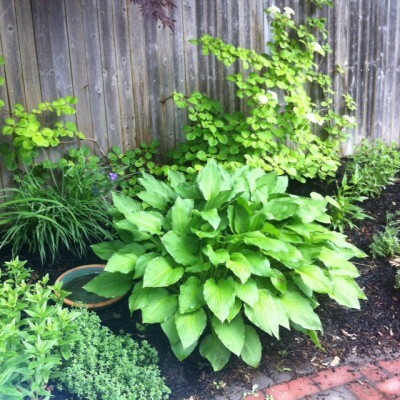 Whenever I’d go to the garden store for advice on what to grow, I’d always get the same reply: “hostas; they love the shade.” Of course, there were other standards: astilbe, bleeding hearts, or an occasional hellebore recommendation. I was frustrated! But, fast forward about eight years, and I must say, I love hostas. I never came to appreciate hostas until we moved to Albany. Our backyard had very little going on when we moved in. It was basically a big rectangle with some sad looking grass. There were two small garden borders around the house. One had some various perennials growing and another was lined with enormous hostas. I remember thinking that they were really impressive. After we installed our brick patio, we used the dirt that was excavated to create raised beds all the way around the yard. The raised beds are mostly shaded because they are underneath some very mature maple trees. Once again I had to figure out what I wanted to grow in the shade. I decided to divide the hostas from the other border as an economical way to fill in the new raised beds. Over the past couple of years, I have continued to divide these hostas as they grow and it’s been amazing to see how quickly they rebound. I have come to really appreciate their lush foliage and low maintenance beauty. As much as I like flowers and sun loving perennials, I have begun to take a real interest in foliage. I think contrasting textures can make just as big of an impact. While hostas do flower, I’m not a big fan of their lily-like stalks. I tend to cut mine down as soon as they shoot up their flower. I just find them messy and disheveled looking, which sort of defeats what I love most about hostas in the first place. 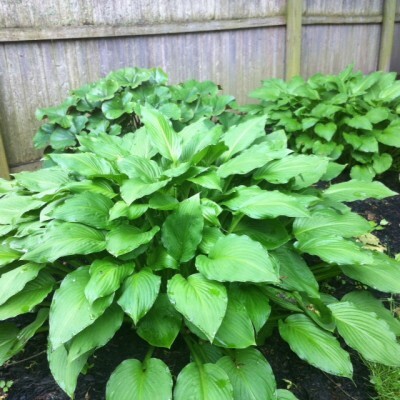 Apparently, hostas are the most popular perennial in America. Normally, this type of information would be a turnoff for me. I like to have a more unique style. However, I’d say that hostas are to a garden, what a nice pair of jeans is to an outfit. You start with nice jeans and use accessories to bring out your individual style. When building a shade garden, start with several varieties of hostas and then fill in with an assortment of other plants and garden art. When you have a backdrop of green, all of a sudden a bright colored chair positioned nearby becomes the star. 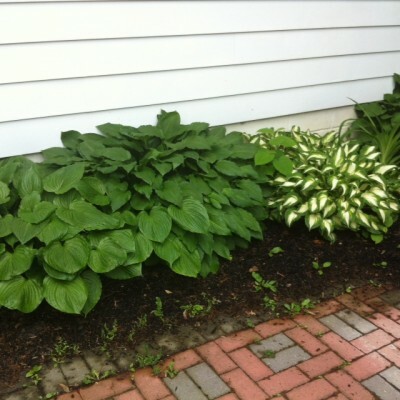 I will be highlighting more of my shade choices, but here are a few pictures of how I’ve used hostas in my own yard. I moved this hosta about three years ago. This garden bed does get more sun than hostas typically like. This one has tripled in size since I planted it and does not seem to mind the morning and afternoon sun. I make sure to keep it well watered. Here is an example of the green backdrop I mentioned. 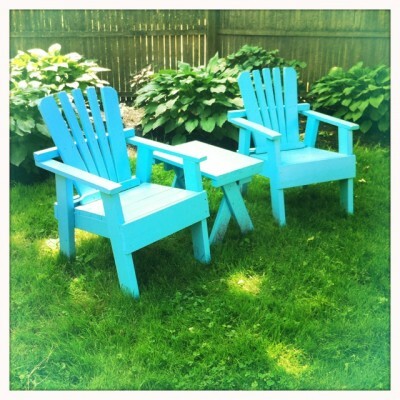 There are so many great colors to choose from for adirondack chairs, bird baths, whatever! When situated against bright green foliage, they really pop! I can’t help sharing this photo. 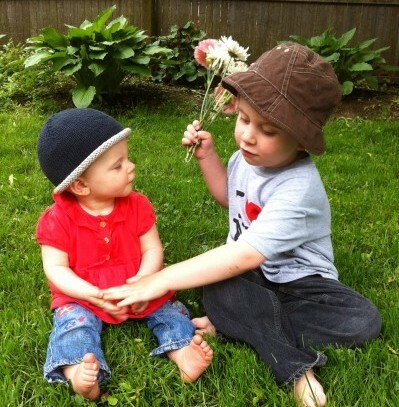 I took it last spring and I think it’s my favorite that I have ever taken of my kids. Again, just an example of a green backdrop, but mostly just an excuse to share this picture of my little babies! HOSTAS!! Gotta get us some of those!! Thanks for the tip! You are brave to ask the store clerks what they suggest. Who knows what they would throw your way. We have a ton of Rhody’s right now… and they are in bloom for about 10 days and then they just look a big weed bush. Don’t like ’em. Cute pic of your kiddos! Show it off as much as you wish!! Love the darling picture of your kiddos! Olive looks like such a big girl now compared to that photo. I didn’t know about hostas until we bought our house and the previous owners had several hostas in our shady garden and I agree, I really love them! They require no care and are such pretty, green plants! You basically just described my boring squarish yard except we get great sun in all but one spot. I’m thinking a couple hostas there for sure. And since my co-worker made me aware of them, I see them EVERYWHERE now. They really are popular! So now I just need some things to plant around them, so it looks cool but not messy. Ideas? Oh and in your third photo, I think I have that plant in the low left corner — what is that? Is it about to bloom purple flowers? love hostas!! but i do adore the flowers–it’s like an added bonus to such a beautiful plant, their tall spindly stems intrigue me, and mostly they’re purply shades, so that’s always a good thing in my book. of course, it’s wonderful that we’re all different as are plants or the world would be totally boring!! my friend’s hubby was a major master gardener–published and national chairman of primrose society or something…anyway, he said when you move into an established place, no matter how bad the garden, to wait for a year to see what all comes up as you’ll always be surprised what’s hiding there. so happy you love gardening–you need to get certified as a master gardener–you have so much to share. you’d have had fun with adam’s grandma comparing notes! and those kiddos are perfect blooming in your garden, too.